Review of Unibroue Maudite | Beer Apprentice - Craft Beer News, Reviews, Interviews and Info. Today, I’m going to share with you my experience of a very much talked about beer brewed by Unibroue in Chambly, Quebec, Canada called Unibroue Maudite. It’s a Belgian-style strong dark ale that has received exceptional compliments from various “beer geeks” and beer reviewers alike. From the website, unibroue.com, one finds a very descriptive write-up concerning the legend of this beer. 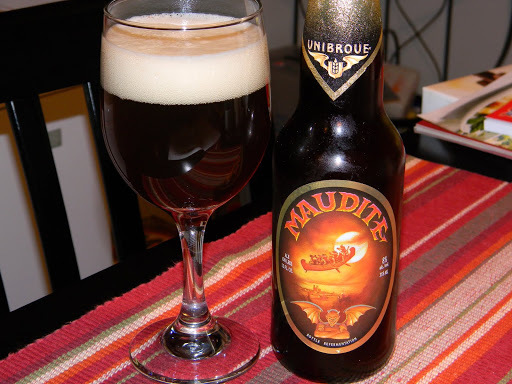 Maudite (damned) was the first strong beer to be retailed in Quebec. The word “Maudite” refers here to the Legend of “Chasse-Galerie” a tribute to the early lumberjacks of Nouvelle-France. The legend tells of eight daring woodsmen who, during winter, yearned to be home for the Holidays. They conjured up the Devil and all of the them pledged their soul in return for flying them in their canoe to their village. As they sailed across the moonlit sky, one of them managed to free himself from the pledge by invoking the name of God, which caused the flying canoe to come crashing down to earth. Well, I don’t want to conjure any evil spirits, but I do want to give it a try. This brew has an 8.0% ABV and comes in a 12 oz. bottle with a cool, little label. The Maudite poured a very nice dark amber, dark copper color. A bountiful, barely off-white head was produced that had excellent size, retention and spectacular lacing. The cap settled to a nice skim right on top. This thing looks great in the glass that’s for sure. As I moved in for a whiff, the first aroma I found was a fairly prevalent and robust hint of booze. It’s actually similar to what I have found in red wines, yet only a tad more “hot.” I also picked up on some sweet caramel malt and Belgian yeast combined with dark grapes and relatively strong spices. In the background, a floral compound seems to lighten the mood and cool things off for a moment only to be removed once the beer warms and invites the somewhat overbearing malt back to the party. This is a bold fragrance. Maybe just a bit much for my liking. As the first drops of the brew glanced my taste buds, I was immediately struck by the strong booze and heavy malt. I proceeded to take a bigger gulp on my second go ’round and found a welcome caramel sweetness that distracted me from the booze for a minute, but as I continued, the sweetness became more rich and overpowering. Man, I can’t win here. On through the profile a spicy clove zing became evident as well as a dried, dark grape savor. Overall, this taste was just a bit too complex for me I guess. I found myself struggling with it just a bit. The mouthfeel was medium/full and very dry. I didn’t think it was very smooth or creamy, but more sharp and slick if that even makes sense. The Maudite coats the palate with a lavish amount of flavor, alcohol warmth and burn. I found the alcohol warmth to be about as dominant as any brew I’ve reviewed thus far. Generally speaking, this beer was just ok for me. It’s a complex brew with an outstanding appearance and mouthfeel, however it might be a bit more advanced in the aroma and taste than what I’m accustomed to. The prevailing alcohol characteristics in both the nose and taste were a bit troubling. With that being said, I didn’t find it to be a beer that I could drink continuously throughout the night. One or two and that would probably be it. I haven’t had the opportunity to sample very many Belgian-strong ales before, so I’m sure as I become more accustomed to them I will find more and more pleasing and satisfying characteristics. I can tell that it is a very well made beer and I’m sure more advanced “craft beer” enthusiasts salivate over this particular Unibroue, but I may have to wait a while before I try it again. Has anyone else had this experience with the Unibroue Maudite? Thanks for reading and commenting guys. Until next time. Cheers.